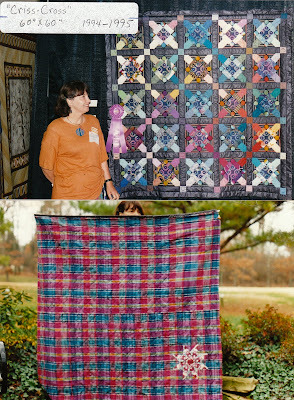 A chronicle of all the quilts that I've made over the years since 1993 when my adventure in making quilts and quilted art began. 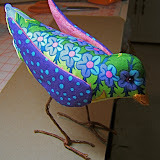 Most patterns are my original designs or are personalized adaptions of traditional blocks. 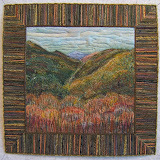 My original intention was to make textile art that combined skills and techniques from many years of learning and exploring needlework skills with quilting as a foundation. 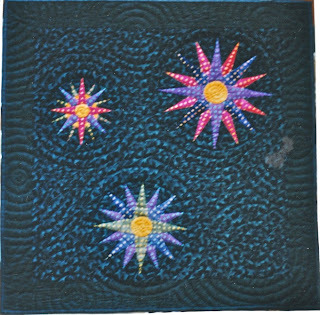 This one was begun before I knew anything about quilting. 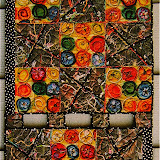 It is hand-pieced silk and the blocks are 2 1/2" square. 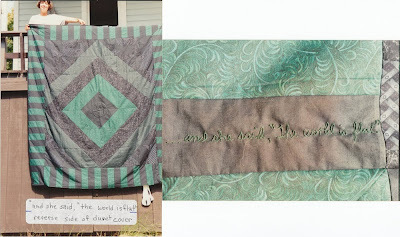 The idea I had for finishing it with a border of accordion quilting didn't work. It may be finished some year now that I am much more knowledgeable. That won't happen until the mood or inspiration strikes. In the meantime it wait its time at the bottom of a chest. 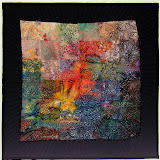 Made of silk fabric samples cut in 1" squares. My intention was to make all of my quilts with this "accordion" technique. 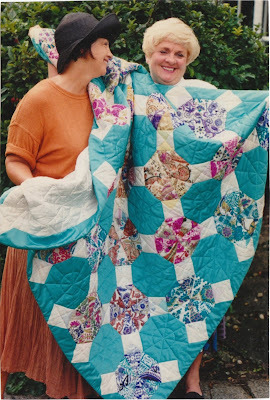 However, the process of learning the craft of quilting waylaid that plan. Read about this wall piece here. I realized that the craft of quilting needed to be added to my skills. 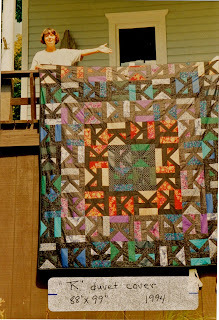 That included piecing, construction, and hand-quilting. The block is based on my first initial as an exercise in Nancy Halpern's workshop at Arrowmont. The objective was to have each block appear to be different, though they're the same. Made of silk. 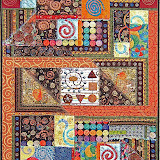 The center is made from leftover silk squares from "Patchwork Perspective". 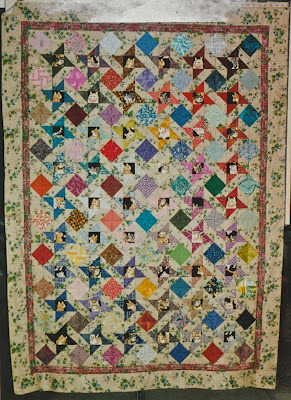 Family Connections or "Love For Myrtle"
The desire to make a quilt for my younger sister's 50th birthday is what got me started. I designed a block with a center of hand embroidery featuring the names and birth date of her 6 children and all her grand kids. 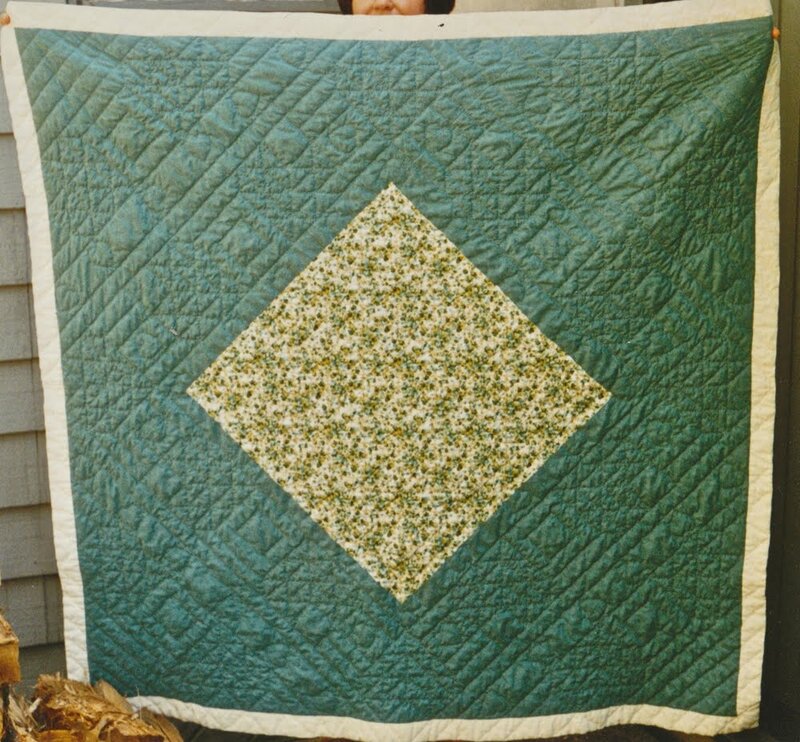 I constructed the quilt and our mother hand-quilted it. I've since added a number of grand and great-grand children's names. 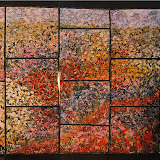 An abstract composition based on a geometric foundation of squares. 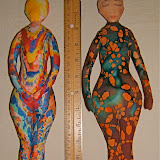 Fabric patterns and colors are used to represent the emotions involved in a long relationship. 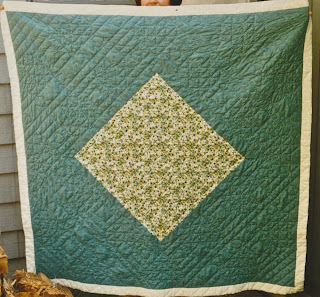 This is the quilt for my brother's anniversary present. The story is written on the label. 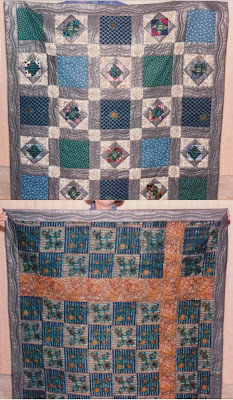 Cotton fabrics and hand quilted. 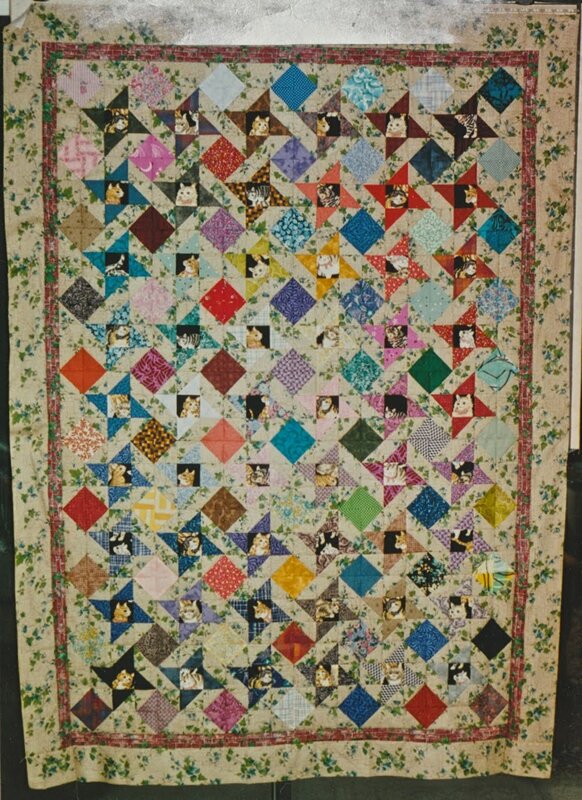 Quilt made for an ill child going through major medical procedures. 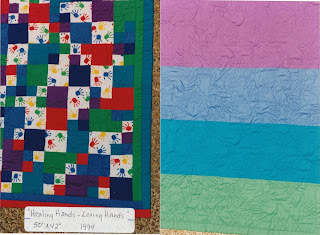 The quilted hands are from a tracing of the child's best friend. The title comes from a statement made during the time that I was designing the green side. 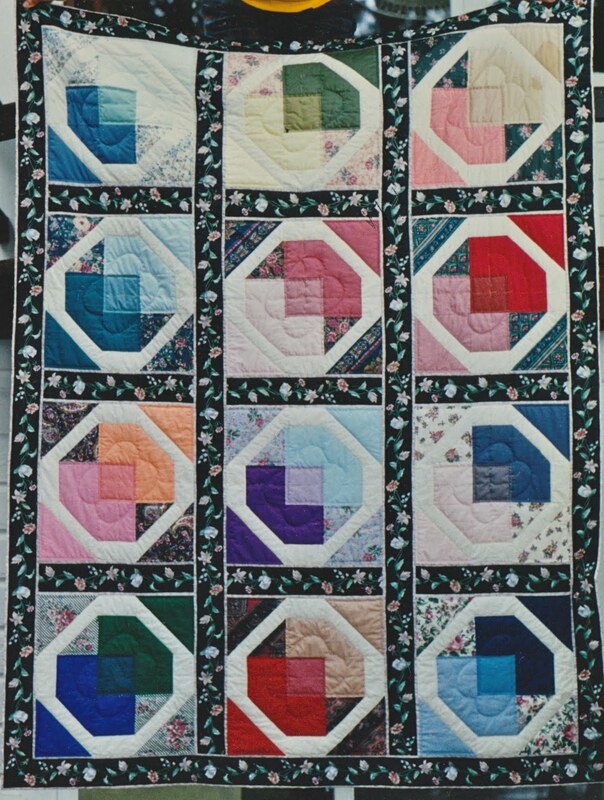 The colorful side features blocks designed around the first initials of my son and daughter-in-law (K & T), who were the recipients. Cuddle quilt made for my best friend's first granddaughter. Cats are seen cuddled under quilts that are tied with cotton floss in the windows. The backing fabric was a remnant of fabric from the child's great-grandmother's collection. I designed a block with a wedding ring circle that encompasses two hues that blend to a third color in the center. The hues represent various feelings or points of view of two people joined in marriage. The blended color represents an understanding or compromise that's necessary for a happy marriage. The rings are various shades of silk, the rest is cotton. Polished cottons are used for the back. 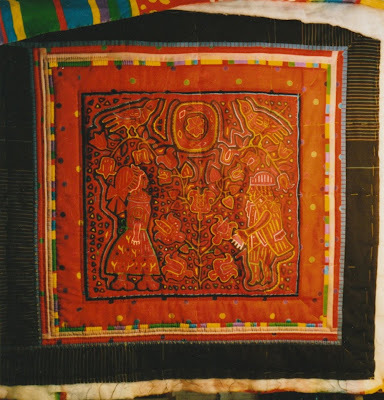 Medicine men motifs from an African print fabric are appliqued to the focus blocks. This quilt was made for an older boy undergoing medical treatments. It was donated through the Knoxville Ronald McDonald House. Constructed in the "strip piece" method. 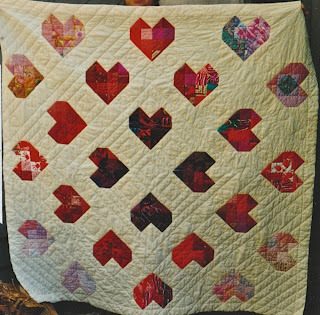 The colored fabric is a small scale print of traditional quilt blocks. I liked the idea of fracturing them. 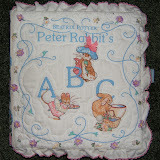 A whole block was used for the back side that is made of polished cotton. Again, I wasn't about to hand quilt through all those closely spaced seams. Consequently it's tied with floss. Just playing with a set of fabrics from Thailand. The printed, or right side, of the fabric is arranged to form diagonal stripes. The "plain" color areas are the wrong, or what I call the "other side", of the fabric. This is waiting to be quilted. 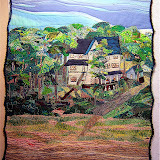 At the time I didn't want to hand quilt through all those seams on this densely woven cotton. Someday it will be machine quilted. I was learning more and getting good at construction techniques and quilting by hand. I very much enjoyed the process. 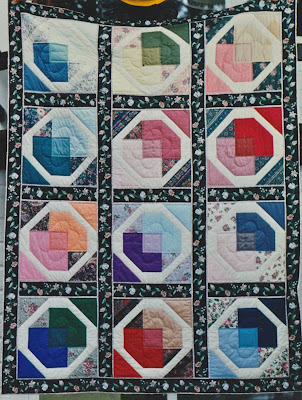 The same block pattern in the quilt made for my sister's 50th birthday is used to play with colors flowing and mixing across the quilt. My stash was a lot of fabric samples consisting of various materials ... there's wool and silk mixed with mostly cotton fabrics. 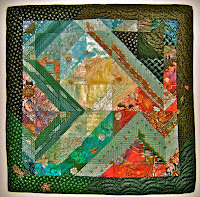 The center of the blocks are from an old batik blouse given to me by a friend. 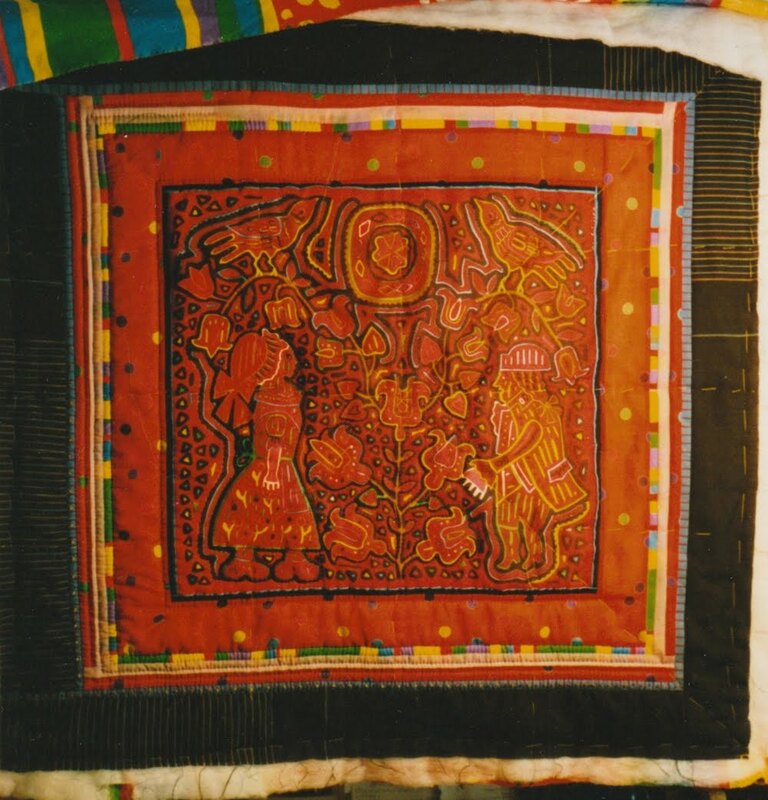 The horse/rider motifs are cut from a batik fabric. The alternating blocks are a thin cotton plaid. 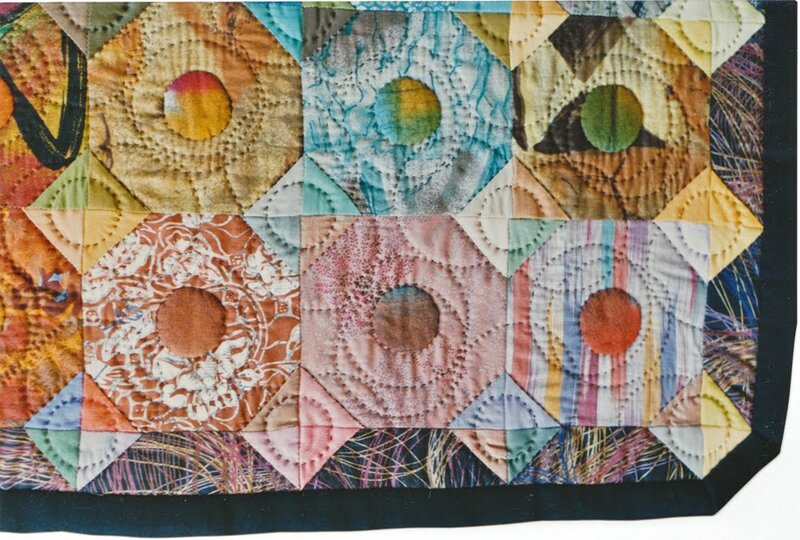 The backing is another batik that reflected the pattern and hues on the front. Pieced circle blocks made from sari silk samples is the main part of the design. All the fabrics used are silk. 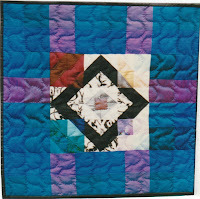 Another quilt with my version of a wedding ring block. 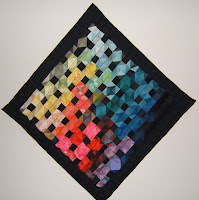 I was just playing with plain blocks that had triangle corners sewn onto them. 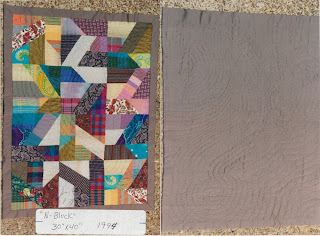 Those corners are silk while the blocks are a variety of different weight cottons. 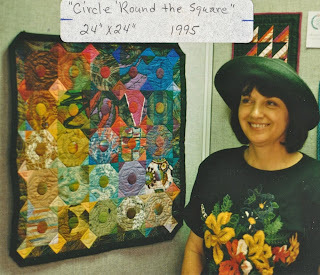 The appliqued circles are from a batik fabric dress that I had made. 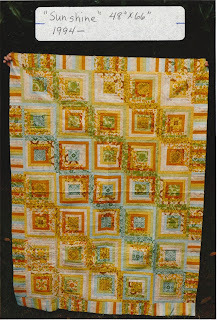 Donated to SMQ Guild SmallQuilt sale at the Dogwood Arts Festival. 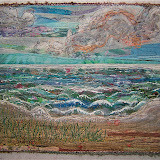 Purchased by TVA for corporate art collection. A whole clothe wall hanging made from a piece of imported cotton batiste from the Torii (mother-in-law's shop). The figures resembled the young couple it's made for. The heart block was the one chosen for the SMQ guild's block drawing for the month of February. I made a bunch for the drawing and didn't want to stop. I was having too much fun selecting fabric combinations that denoted emotions. 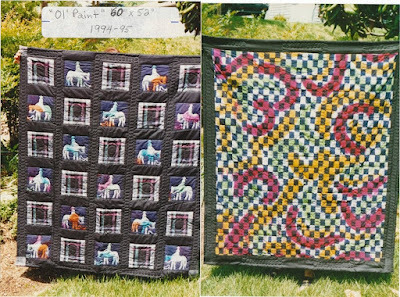 Some of the house blocks that were won in a SMQ block drawing are featured in this quilt. I designed a pond in the center and scattered quilted animals throughout. 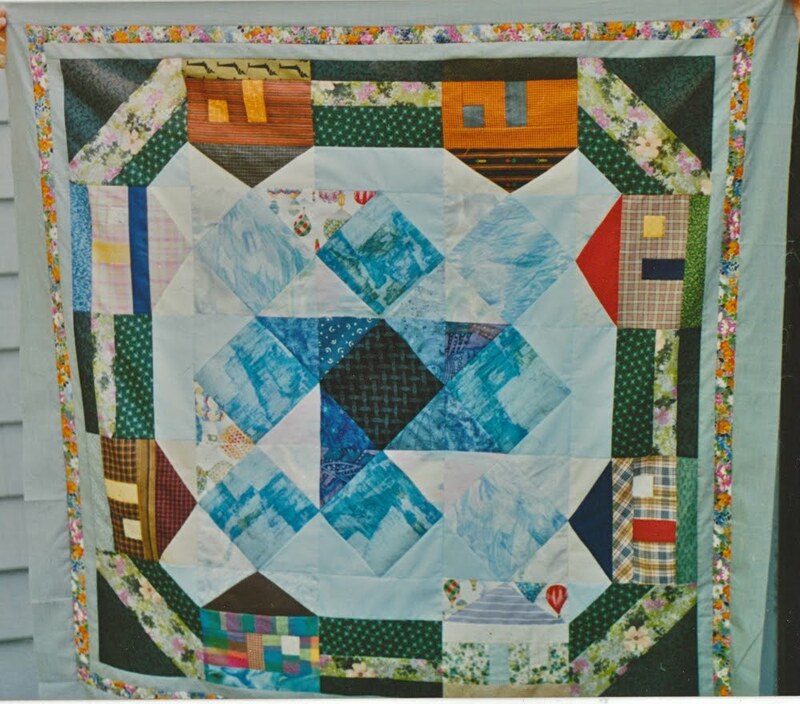 The title of the quilt expresses a common wish of every child who's ill and away from home. Donated to Ronald McDonald House. Just playing with a technique to make a bunch of half-square triangle blocks. 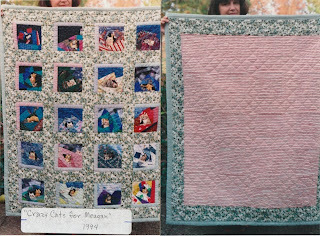 Plus there were still lots of cats leftover from the themed fabric in Meagan's kitty quilt. This is a cuddle quilt at the cottage. The stars were made in a workshop taught be Jane Hall. Gifted to our son at the birth of his twin sons. 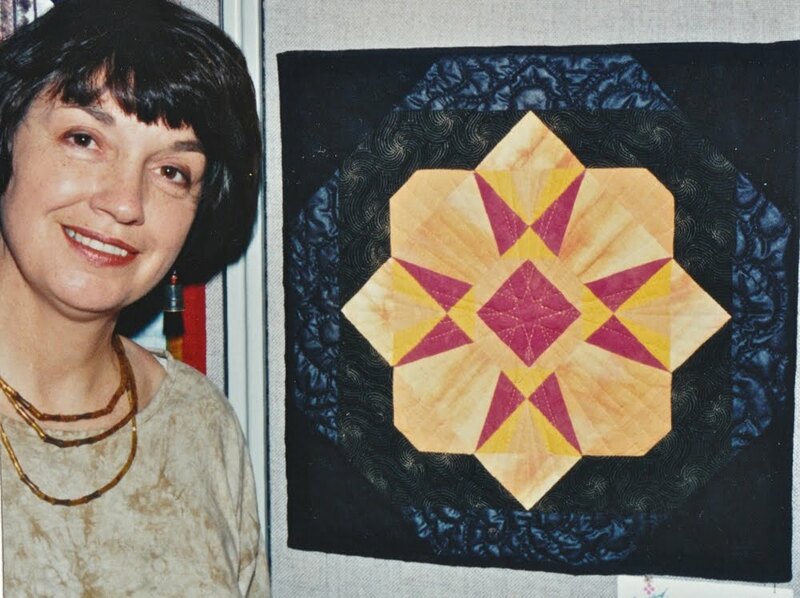 A paper-pieced pattern that was designed by a Holland, Michigan quilting friend. 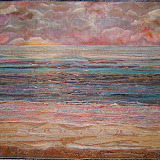 Donated to SMQ Guild small quilt sale. 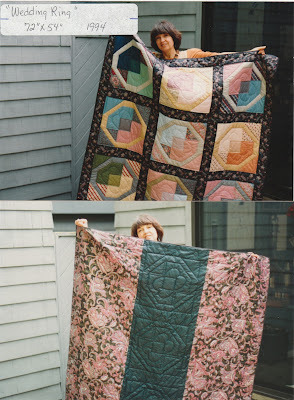 NOTE: It will take sometime for me to record all the quilts that I've made through the years. This will be an ongoing project that's worked on when I have a bit of time as well as access to scan photographs.